Teaching Science to young children is not as hard as you think – and inquiry science is a natural fit for the way young children see the world. Just as listening to stories and learning the alphabet introduces young children to the world of literacy, inquiry science gives children the building blocks to learn how to observe their world, ask questions, and solve problems. Science in early childhood can be integrated across the curriculum. The critical thinking tools of investigation and problem solving support and inform how children learn literacy, math, art, and even social-emotional development. What is so exciting about inquiry science is that it is flexible enough for you to integrate the approach in any curriculum that you are using. All it takes is the commitment to bring out the little scientists in each of your students! Although the National Air and Space Museum has long been a favorite destination for families with young children, in 2008 early childhood programs became a special priority. Thanks to the support from the Conrad N. Hilton Foundation, the Flights of Fancy early childhood program was established with two dedicated early childhood educators on staff. 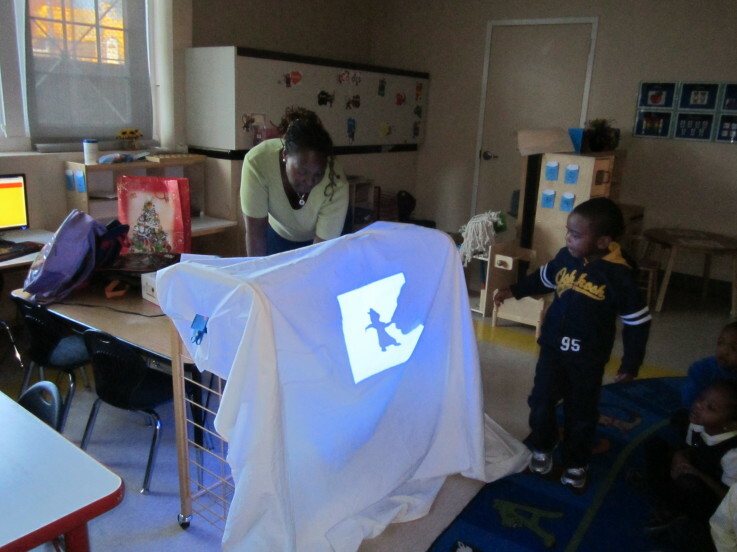 Flights of Fancy provides a variety of programs for families with young children and early childhood schools in the DC area, such as Story Time, puppet shows, and musical performances. Science in Pre-K began as a cooperative effort between the National Air and Space Museum and DC Public Schools, supported by PNC Foundation’s Grow Up Great with Science. It was a small professional development program that has now expanded to a national audience. The goal of the Science in Pre-K website is to provide you with a foundation in physical science content and teaching methods for science inquiry in a preschool environment. We hope that Science in Pre-K will provide you with more confidence in your ability to design ongoing learning experiences for young students to explore scientific subjects! Science in Pre-K is proud to be part of a dynamic community of dedicated educators and researchers that have paved the way for early childhood science education for teachers. The Science in Pre-K program is modeled after the tremendous research of the Education Development Center's "Young Scientist Series." Click here to learn more about other leaders and collaborators in early childhood science. The Science in Pre-K Website is divided into five sections that offer teachers and other early childhood educators opportunities to explore the Science in Pre-K inquiry approach and concrete tools to apply these ideas inside and outside of the classroom. Explore Inquiry Science and the Science in Pre-K approach to inquiry learning. Search resources including images, videos, lesson plans, field trip stories and other tools that can assist you as you incorporate Science in Pre-K into your curriculum. Find ideas and inspiration for finding science beyond the classroom and integrating those science lessons into class time. Check out some specific examples of field trip ideas to the National Air and Space Museum, and general guidance for bringing young children to museums, science centers and other learning sites. Develop a knowledge base of science content for Science in Pre-K and learn how to teach science topics using the inquiry method. The section includes valuable information for each of the science areas: Building Structures, Light and Shadows, and Exploring Water. The Educator's Sandbox is the official blog of Science in Pre-K. In this space, the Science in Pre-K community will share some extra tips and musings in inquiry science learning and provide support for one another.